Sad as I was to leave Amy, the show must go on. On my way out of Charlotte, I accepted the gracious offer of some newly-discovered family to have a good meal and make some music. I had met Kerry and Laura at my sister-in-law’s baby shower. By the end of the night we were singing “Seven Bridges Road” in 3-part harmony for the remaining revelers. Safe to say, we hit it off. This visit was no different. I wonder sometimes how best to make visitors feel welcome. My life has been privileged so far, in that I have been lucky enough to see how many different kinds of people keep house. I’ve seen couples rattle around enormous, richly appointed mansions. I’ve seen scholars ensconced in apartments crammed to bursting with books and texts. I’ve met witches in their sacred spaces and punks in their hovels. I’ve been to a magnificent house built to look like an anthill. Filthy bachelor pads, recluse mouse nests, Zen Buddhist bedrooms. There is nothing I can tell you of my visit to their house that doesn’t pale in comparison to how it felt inside, to be their guest. Laura and her daughter rolled out my very favorite musicals. The piano rang, we sang. Nothing ostentatious. Honest. Wonderful. That night, I found a new piece of the life I want. I never knew before that making music alone felt selfish and empty in contrast to this unpretentious collaboration. I did not expect to find visions of my future in Charlotte. Yet there they were, inimitable and large as life. I want a place to call home, a place to make selfishly my own, a place for music among friends and sometimes solitude. Where will I land? The question remains. New Orleans and the Southwest are on deck. 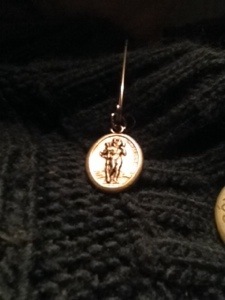 St. Christopher has a plan.